"Adonis can you fly to Manila tonight?” “Sorry boss I am in the middle of an island and the only outrigger boat that plies between this island and the mainland already sailed this morning.” That was the lie I had to make up when I got the message from my boss on my way to Biliran. That was going to be the last and only climb in my one month vacation. Aboard the van, it was apprehension instead of excitement that overwhelmed me. I was going to relive an old habit—to GO without a definite destination. Back when I was a newbie, I was not aware of the dangers of setting out on an adventure without an itinerary. But now that I’ve grown wiser and more informed, I’ve come to believe that my instincts have weakened and my beginner’s luck has abandoned me. My zeal for adventure has been replcaed by caution and fear. So on a dare, I planned to climb but I didn’t plan the climb. Four points of interest were scrambling to get my mind’s attention—Mt Panamao, the unclimbed Mt Maripipi, Tres Marias and Samabawan Island or a combination of any two or three of them. When I got to Naval, Biliran I forwent the two boat trips to Maripipi Island for some activity with an old friend. After lunch I took the ‘multicab’ to Kawayan. There, you can charter a motorboat to Maripipi and Samabawan Island from P500 to P1000. I chose the P25 motorbike ride to Tubig Guinoo (the jumpoff to Mt Panamao). Mt Panamao is popularly believed to be the highest mountan in Biliran but my GPS device recorded only around 1100masl. Its very close neighbor Tres Marias (which may appear in topographic maps under other names) is documented to be higher than 1300masl. Mt Panamao last erupted in 1939 and is said to erupt every 130 years. The legends of giant snakes in Mt Panamao attracted the adventurous hearts of many daredevils long before the waterfalls of Tres Marias were seen on the internet. Mt Panamao also affords better vistas of the northern islets of Biliran including the imposing Mt Maripipi and the islets of Sambawan. With the rise of Tres Marias + Samabawan Island to fame, Mt Panamao was left in oblivion. In the last five years, less than ten climbs by non-hunters have been recorded in the office of the local government unit of Kawayan, Biliran. Mt Panamao is traditionally accessed via Brgy Tubig Guinoo in Kawayan but the trail on the Almeria side of Panamao is now clearer and more established. In Tubig Guinoo, when you say Panamao, people will point to only one guy—Martin. He is the reliable guide in the legend-shrouded mountain. He knows all the trails of Mt Panamao and he is one of the few locals who have set foot on the highest point of Mt Panamao. The second choice is Jose, a hunter who is believed to be the best at warding off snakes and remedying snake bites. I was told that last month two locals and one non-local died of snake bites in the foothills of Mt Panamao so I requested for Jose. But his knees were already too weak for a trek. So Martin and Jose’s son Samuel became my crew upon Kuya Jose’s refusal. We traversed the route from Tubig Guinoo to Almeria and I learned a few things along the way. 1. Keep pounded garlic in your pockets to fend off snakes. The local hunters will tell you tall tales of their encounters with big snakes. 2. Locals, including their late governor Danilo Parilla, climb Mt Panamao to see the wreck of a warplane that crashed in Mt Panamao during the second world war. Stories of this plane crash were Samuel and Martin’s trail food during most of the trek. 3. When cows go near you, in Mt Panamao, they are just asking for salt. They won’t hurt you. Find their feeding ground/rock and bend and gesture as if you are putting some salt on it and they will search for the salt. After realizing that you have fooled them, they’d just bid you a goodbye moo that would sound like putanginamooooooo! 4. Slow long trek wears me down. We had to slash our way through the thick forest that abound with nasty thorny uway (rattan). This made the journey very slow and long. When I noticed that we were moving slow, I would allow enough distance between me and the guides and then I would trek fast. That way, I regained my vigor. 5. Seven years of climbing doesn’t guarantee good packing skills. I packed my tent but I forgot to bring the poles and pegs. I forgot to pack my spoon and fork. I also forgot to buy Cobra and Gatorade which was the reason why I got so pumped during the ascent. 6. When all else fails, Lucky Me pancit canton saves the day. During lunch my throat wouldn’t accept rice or any food. I would throw up at the sight of canned corned beef and rice. My exhaustion made me kind of anorexic. The only thing I could swallow was Lucky Me pancit canton. Mt Panamao is a very good experience. And although I could call it paradise, I am sharing this information with you because I know only the ‘true-blooded’ adventurer will dare to take their chances with the snakes and travel far to the not so popular island of Biliran just to climb a mountain. And to tickle the imagination of the adventurer in you, Mt Panamao (via Tubig Guinoo) will soon be re-entering the exploratory-climb category just like Mt Pangasugan in Baybay, Leyte. The vegetation had grown thick and the route is a complicated. The only two guides in Tubig Guinoo have grown old. And Samuel said he will forget our trail if his second climb doesn’t take place in the next three months. And here I am impishly grinning with the idea that even when the access to this paradise disappears with the retirement of the guides, I hold the key in my GPS map. Padayon Sir adonis! miss na kita makasama sa trek natin. kelan ulet tayo maglalakbay? hindi ako nakasisiguro sir Kevin...pero sa August pupunta ako ng Manila..
Wow just climbed that mountain last Aug. 26-27, 2017 this time with older Martin as our guide. We intend to exit palay to traverse to Tres Marias unfortunately Martin could no longer remember the right trail we end up scaling all the possible trails to no avail (parang trailblazing). Can you share the GPS trail waypoints for this majesticly pure mountain? 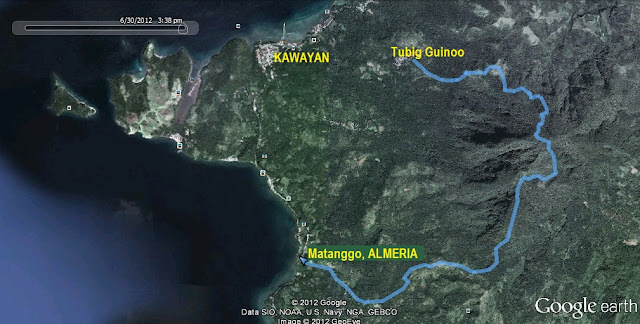 I'll be trekking up Tres Marias this 26th May, and i plan to do a traverse to Mt. Panamao, then a sidetrip to Sambawan Isl. I sure do hope to hear from you soon. You can reach me at 0923-668-4866, or email me at herphermits@gmail.com. A big thanks again. And more power to your blog.